In the summer of 1776, soldiers from the First Maryland Regiment marched to New York, joining with the Continental Army under the command of Gen. George Washington in order to defend the city from the British. On August 27, 1776, the Americans and the British fought the Battle of Brooklyn, sometimes called the Battle of Long Island, the first major battle of the Revolutionary War. The battle was a rout, as the British army overwhelmed the inexperienced and poorly-trained Americans, many of whom had only a few months of military service. As the Americans retreated, a portion of the Maryland troops made a series of charges against a much larger British force. These men, now known as the “Maryland 400,” took heavy causalities, but were able to hold the British back long enough to allow the rest of the Continental Army to escape complete destruction. Finding the Maryland 400 is an effort led by the Maryland State Archives to learn more about these Marylanders, and discover their names, their lives, and their stories. You can read the biographies of the soldiers who fought at the Battle of Brooklyn written so far or check out the blog to read more about the life and times of the Maryland soldiers. The project is supported by a generous donation from the Maryland Society of the Sons of the American Revolution. Additional support has come from the Maryland Military Department, Office of the Adjutant General, the Maryland Military Historical Society, Washington College, the Moss Family Foundation, the First Maryland Regiment, Inc., and Belair Mansion. Please comment on, follow, and share our site, and be sure to follow the Maryland State Archives on Twitter (@mdarchives) or like the Facebook page. To contact the project, please email us at msamaryland400@gmail.com. I am trying to verify early stories about one of my wife’s ancestors, “Captain” Michael McGuire. He is reputed to have served in the Frederick County Militia and under General Smallwood form the siege of Boston onward. At least one veteran’s statement links him with Bruce’s regiment. This may have placed him at Long Island and White Plains and I would like to find out. I have not been able to find him on muster roll cards or other lists. He survived the war and settled in Cambria County, Pa. Any information is appreciated. Thanks for you inquiry. It looks like there was a Captain Michael McGuire commissioned in November, 1775 from Frederick County. If you send me an email to msamaryland400@gmail.com, I’ll pass on a little more info on what we’ve been able to find, and some suggestions of what other sources you may be able to use to get more information. Thank you for working to identify and honor the Maryland 400. I am as resident of Brooklyn, a passionate advocate of Brooklyn’s little known and pivotal role in the American Revolution, a military history fan and a tour guide (www.Levysuniqueny.com)with a “Brooklyn in the American Revolution” tour that includes The Old Stone House, Prison Ship Martyr’s Monument, Fulton Ferry/Brookland Landing and Battle Hill in Greenwood Cemetary. Thank you for the support; we are glad that you appreciate our work! Thanks so much for posting the documents. In planning a visit to the archives, I went to your website to ook for operating hours and serendipitously found the Maryland 400 item. The list includes a distant relative, Samuel Hamilton. Our information on him so far: b. 1750 Charles Co., MD, son of Patrick Hamilton and Ann Greene Hamilton. Married Christina Smith Clements 9 Feb 1773. Was granted 100 acres for service in Revolutionary War (don’t know location yet) as recorded in Revolutionary War Records accessed via ancestry.com. He died 4 Mar 1807. The Battle is extensively covered with commentary, maps and drawings of sites of importance in The Heroes of the American Revolution and their Descendants: Battle of Long Island, by Henry Whittlemore, 1899 (SAR publication). I would like to know more about the land grants. He is on the Hill Family Tree in ancestry.com. Can I download the photo of the monument and map? Thanks for your efforts. Thanks for checking out the blog! The map is from the Library of Congress–check out this post, which has a link to their site, where you can download it: https://msamaryland400.wordpress.com/2013/07/18/battle-maps-of-long-island/. I’m not actually sure where we found the photo of the monument, I’m embarrassed to say…probably somewhere on google. Thank you for your fine work to identify these men. As I read the blog, I immediately thought of an ancestor identified as being a member of the Maryland 400. My family genealogy written by Thomas R. Gardiner “Gardiner: Generations and Relations” notes one William Gardiner, born 1749 in Poplar Hill, Valley Lee, Maryland, died June 2nd 1836, in Inclosure, Gallant Green, Maryland as enlisting in the Charles County Militia during the War of Independence. William Gardiner survived the war, and lived until 1836, having married and had children. A highlight of Thomas Gardiner’s life is mentioned as visiting the rededication of the monument to the Maryland 400 in Long Island in 1991 shortly before his death. A copy of “Gardiner: Generations and Relations” was requested by and resides in the Maryland Archives. Thank you for reading and sharing the story of William Gardiner- what a great family connection! The bio posted at this site has John married to a Margaret Kennedy. What is the source for this marriage? The source for most of his biography was his pension file, which is online via fold3.com (but which we can’t post online ourselves). His pension contains a letter from a member of the Waukegan, IL chapter of the DAR that indicates he married Margaret Kennedy. There isn’t any further information of documentation. If you have information that would help us, could you send an email to msamaryland400@gmail.com? Thanks! Hello, m Thomas L Garner JD and I am researching the Gardiner family of Maryland. I have both books written by Thomas R. Gardiner “Gardiner: Generations and Relations . Period. Based on information I have found on ancestry.com and family tree DNA it appears that I several other individuals who have matching DNA are part of the Gardiner family of Maryland. If possible, I would like to contact Mr.Brian Gardiner and share the information I have about the Gardiner family of Maryland, and their relationship to William Gardiner English knight who was married to Helen tutor first cousin of Henry VII. Tutor in King of England. William Gardiner English knight apparently killed Richard the third at the Battle of Bosworth Field and was knighted for his efforts allowed to marry into the tutor family. Some of their family eventually came to Maryland. Richard Gardiner was listed as a passenger on the Mayflower and signed the Mayflower compact. His son Luke Gardiner was the progenitor most of the Gardiner’s in Maryland. Mr. Garner just found your email. I am a direct descendant of “Richard Gardiner”. I have done some research on the Maryland Gardiners since Tom G. passed away in 1991. It appears that Richard may not be related to the Bermondsey Gardiners. I’ve visited St. Mary Magadalene, yet have not been able to connect our Richard to a specific place in England. I attend the church St. Francis Xavier, where his son Luke, was a witness to the Bretton deed establishing the church, and grew up within a stone’s throw of his home called The Riverview. I cannot find the citation for this, nor can I find his birth or death record. Do you have access to this? I don’t know if your ancestor was part of the Charles County Militia. The only Joseph Gardner that I can find in the militia served in Capt. Walter Smith’s company of the Calvert County militia in 1777 (S. Eugene Clements and F. Edward Wright, The Maryland Militia in the Revolutionary War,148). I can’t find any Joseph Gardners in the records of soldiers from Maryland who served in the Continental Army, either. There could be others, including your ancestor, that I didn’t find with a pretty quick search. The question of whether he (or McPherson’s company) might have fought at the Battle of Long Island is easier. There was no militia from Maryland there–only full-time professional troops. Militia was intended to be a home defense force, and didn’t serve full time. Only soldiers from the First Maryland Regiment commanded by Col. William Smallwood, or the 4th, 5th, and 7th Independent Companies were present at the battle. Many Maryland militia units did see some active duty during the war, responding to threats from the British, but not at the Battle of Brooklyn. I hope this helps, though I’m sorry I don’t have more definitive info for you. Thanks for checking out the blog! Thank you for sharing that article! It would be amazing if this truly is the grave site of the Maryland 400. Our project is working to memorialize the Marylanders who served at the Battle of Brooklyn, and to learn the names of the fallen, so they can be recognized even if the burials are never found. 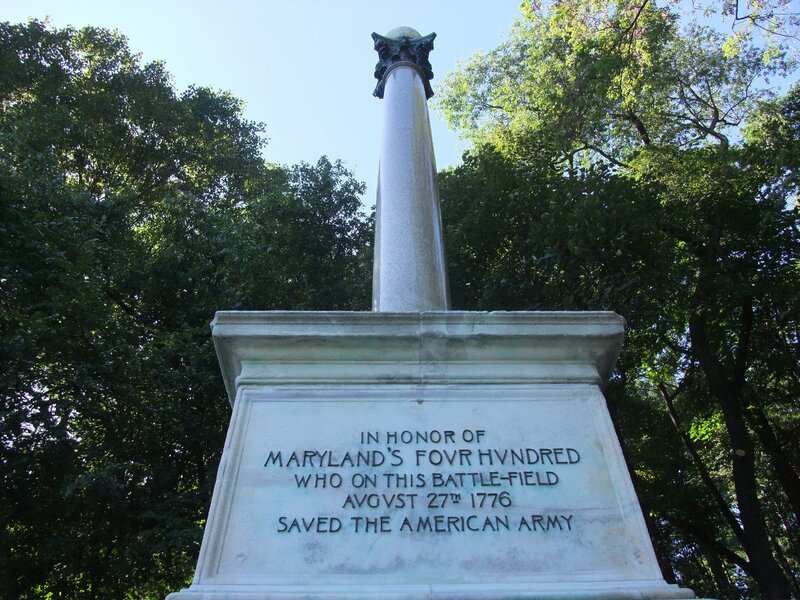 Sadly, we still don’t even know how many Marylanders were killed at the battle (there were 256 killed or captured), but the names we do know are posted here: https://msamaryland400.wordpress.com/2015/08/27/battle-of-brooklyn-roll-of-honor/. Thank you for all your work! My 5th great grandfather was Leonard Watkins. Several of the other men were brothers of some of my 5 times great grandmothers. So a lot of family connections to these men. So awesome to see them being honored this way! Thank you for your kind words. I’m glad that you have enjoyed what you’ve read. Do you know more family info about Leonard and his relatives that you can share? We’d love to hear about it! You can email us at msamaryland400@gmail.com.